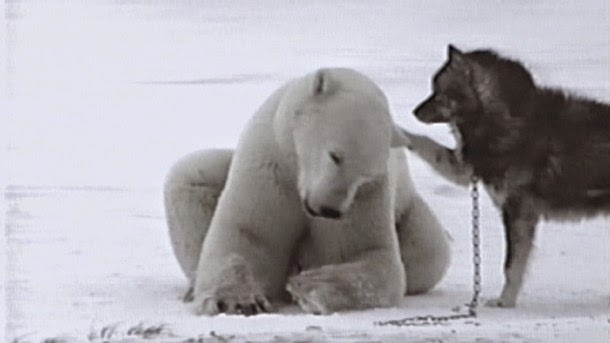 Bringing together wild and domesticated animals often times ends with the domesticated one becoming too scared to even move, especially when we’re talking about domesticated dogs and a 200 pound wild polar bear. However, this match-up didn’t really end as bad as most of us think it would. Surprisingly, the dogs and the polar bear went along quit well. They even played together in the snow. The human owners of the dogs keep a working distance of around 70 feet way from the bears. So the bears understand to keep their distance, they use cracker shells to scare the bears off in case they come too close. 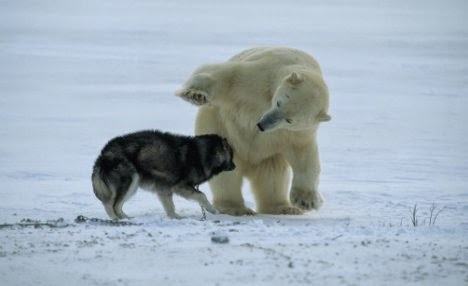 As for the dogs, bears are actually very social and curious. Their social adaptability got them closer to the wolf dogs and they are generally very gentle when they play with them. Old the biggest of the male dogs are allowed to go near to the bears. The humans keep the relationship between the bears very casual. 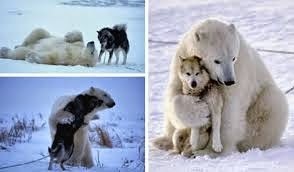 If they notice that there seems to be a bad relationship between one of the dogs and the bears, they pull the dog out. Polar bears are one of the biggest predators on land. They’re also known as “maritime” bears since they spend a lot of time going around ice, snow, and the open water of the Arctic Ocean, hunting seals which are their main prey. They hunt for food by staying near the edges of the ice and biting down on them with their powerful jaws.